PLYMOUTH — Paula Marcoux has more than 10 ways she can cook outside on her wooded property here, which slopes down to pristine Savery Pond. On a picture-perfect day, there are three fires going: One in a rock-lined fire pit, over which a tripod structure holds a grill suspended on metal chains (a German setup called a schwenker); another a small kindling fire centered between a few rocks on which she balances a convex Indian pan called a tava; and a third in the base of an old gas grill covered with a flat cast-iron griddle. 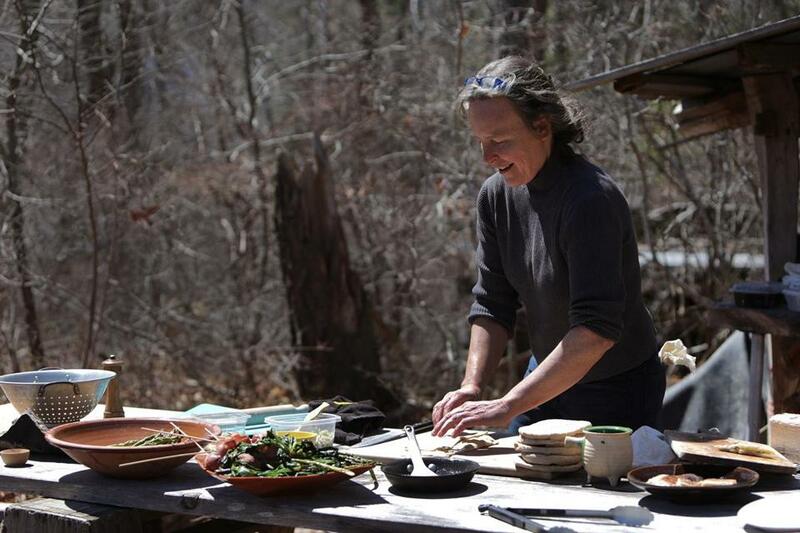 After almost 30 years studying pre-industrial and ancient cooking methods, Marcoux, 53, a former Plimoth Plantation historic interpreter, has just published her first cookbook, “Cooking With Fire: From Roasting on a Spit to Baking in a Tannur, Rediscovered Techniques and Recipes That Capture the Flavors of Wood-Fired Cooking.” The various outdoor cooking options on her land are both practical and part of her extensive research. The book, as much a summary of traditional cooking methods as a compilation of recipes, takes novices through making a fire, exploring age-old techniques and tools, and leading the more ambitious (with 12 pages of instructions and photos) through building a wood-fired mud oven. “Wood-fired ovens are for taking outdoor cooking to the next level or for fanatical bakers,” she says. She considers herself one of the fanatics. Throughout “Cooking With Fire,” Marcoux’s voice is friendly, wise, and instructive, nudging you forward. Take her fire-making advice: “Fire is composed of just as much oxygen as fuel,” she writes, so it’s necessary to start with small sticks and twigs, set up tepee-style, and to grow the flame slowly. Adding hardwood to create a bed of coals for cooking is the next step. “A big pile of small wood is a quicker route to a roasting fire than a small pile of big wood,” she advises. Her practical and environmentally conscious words ask you to consider the “cooking potential” for downed trees and limbs that might be in your backyard or nearby woods. 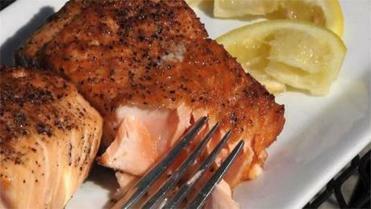 Tremont 647's owner and chef Andy Husbands gives tips on how to prepare and grill foods for the summer grilling season. She practices what she preaches. Amid the ovens and firepits on her property are what many would deem piles upon piles of junk. But to Marcoux, it’s “a collection.” She and her husband, Preston Woodburn (aptly named), whom she met at Plimoth Plantation and who is a timber-frame carpenter, built their home here, a 10-year-plus work-in-progress. At some point, the stacks of wood, mess of tree limbs, construction materials, plastic tubs, metal pipes, and other odds and ends will be put to good use. For everyday meals, Marcoux usually makes a small fire in a stone-lined pit and sets a grate on top of bricks, steel bars, or rocks for support. Essentially, it’s grilling without a grill. More adventurous cooks can roast a whole chicken, duck, rabbit, or fish on a spit; hang a leg of lamb on a string suspended from a tripod; or devise a swinging schwenker. Here’s a fun one: Use the retained heat of a fireplace tool, such as a salamander or iron fire-shovel, to caramelize sugar sprinkled on top of custard, something akin to the golden, crackly top on creme brulee. Or insert a red-hot poker into a glass of beer and rum, a once-popular tavern beverage called a flip, to turn it hot and foamy. On a griddle, Marcoux demonstrates easy seared spinach with spring garlic and asparagus. She has wrapped scallops in prosciutto and when they hit the hot surface, the mollusks cook gently as the meat browns and crisps. Pita goes on the griddle next, and then borek, which originated in Anatolia, and are thin packets of dough wrapped around a filling. Half the pastries contain a cheese and herb mixture, the remainder chopped nuts and sugar. She’s coined the sweet version “campfire baklava,” a riff on the layered Middle Eastern phyllo, nut, and honey pastries. The fire imparts a smoky-woody flavor that no piece of indoor kitchen equipment can adequately reproduce. Most impressive are the two wood-fired masonry ovens on the property, which Marcoux built from rock, clay, mud, and brick. One is in what she calls “French-Champlain style”; the other is also a European mud oven, a kind replicated in Colonial America. She also has a small English cloam (pottery) oven that she experiments with. The ovens, she says, are without equal for baking bread and pizza, roasting vegetables, and cooking pots of beans, stew, and soup. “With bread, the crust is just so different,” she says. Once the flame goes out, the heat in the hollow of the oven is sufficient to cook casseroles, fruit pies, and cakes. When the residual heat is low and dry, Marcoux swears by it for cooking almond meringues that bake crisp and toasty-flavored after a few hours. Marcoux, who cooked in restaurants sporadically over the years, has always been intrigued by the intersection of food and history. Raised in Rehoboth, she majored in archeology at Brown University, and worked on excavations in Jordan and Israel after college. Occasionally, the remains of stoves, ovens, and utensils were uncovered. “It’s not always easy to understand how they work,” she says. In 1987, she took a job at Plimoth Plantation and wound up staying 22 years, researching food history, working on exhibits, and playing the roles of a 17th-century English Colonial servant and other women in the living-history museum. Despite her knowledge of cooking and food history (she blogs at www.themagnificentleaven.com), Marcoux isn’t above learning from more experienced cooks, even those halfway around the world, on YouTube. One was an Armenian woman demonstrating how to stretch the dough for borek by draping it over her arm and carefully rotating it. “These are the best teachers in the world,” she says.